Candice Millard has made a career of writing about lesser-known episodes in the lives of famous men. In “The River of Doubt,” she tells the story of Theodore Roosevelt and a harrowing trip down the amazon. In “destiny of the republic” she recounts the death of James Garfield and the role it played in the development of modern medicine. Now, she has turned to one of Britain’s most celebrated war heroes, Winston Churchill. At 24 his ambition led him to South Africa and the heart of the Boer War. Millard argues his capture – and subsequent escape – set the stage for the historic leader he would become. Excerpted from HERO OF THE EMPIRE by Candice Millard Copyright © 2016 by Candice Millard. Excerpted by permission of Doubleday, a division of Penguin Random House, Inc. All rights reserved. No part of this excerpt may be reproduced or reprinted without permission in writing from the publisher. MS. AMY WALTERThanks for joining us. I'm Amy Walter of the Cook Political Report sitting in for Diane Rehm. 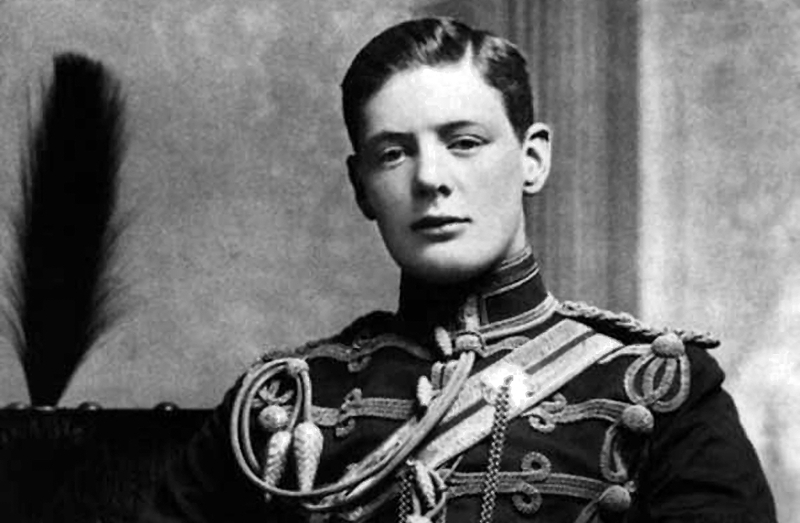 At 24 years old, Winston Churchill's career goals were crystal clear. He was going to be the prime minister of Great Britain. How to achieve that, however, was a bit of a question mark. He knew he had to make a name for himself, do something truly heroic and that's how Churchill found himself in a POW camp in South Africa. MS. AMY WALTERBestselling author Candice Millard tells the story of his capture in a new book, "Hero of the Empire: The Boer War, a Daring Escape and the Making of Winston Churchill. Candice Millard joins us here in the studio. So glad to have you. MS. CANDICE MILLARDSo happy to be here. WALTERThank you for joining us. WALTERFor many folks who might not know much about Winston Churchill or even if they do, I think this is a fascinating look into a portion of his life that we hadn't heard much about. And more specifically, I think, when you look at the cover of this book, it talks about -- you see the term Boer War and you think maybe this is going to be a historical work about the war, but there's so much there that's about a daring escape and it feels like it reads -- to me, it reads more like a work of fiction in some places, than nonfiction. WALTERSo I think to capture that flavor, it would be great if you could just read a little bit of your prologue to set the stage of what we're going to learn about his man that we think we know so much about and yet we didn't get to hear -- to read about it in this detail. MILLARDAbsolutely. "Crouching in darkness outside the prison fence in wartime Southern Africa, Winston Churchill can still hear the voices of the guards on the other side. Seizing his chance an hour earlier, the 25-year-old had scaled the high corrugated iron paling that enclosed the prison yard. But now, he was trapped in a new dilemma. He could not remain where he was. At any moment, he could be discovered and shot by the guards or by the soldiers who patrolled the dark surround streets of Pretoria, the capital of the enemy Boer Republic. MILLARDYet, neither could he run. His hopes for survival depended on two other prisoners who were still inside the wall. In the long minute since he had dropped down into the darkness, they had not appeared. From the moment he had been taken as a prisoner of war, Churchill had dreamed of reclaiming his freedom, hatching scheme after scheme, each more elaborate than the last. In the end, however, the plan that had actually brought him over the fence was not his own. MILLARDThe two other English prisoners had plotted the escape and agreed only with great reluctance to bring him along. They also carried the provisions that were supposed to sustain all three of them as they tried to cross nearly 300 miles of enemy territory. Unable even to climb back into his hated captivity, Churchill found himself alone, hiding in the law ragged shrubs that lined the fence with no idea what to do next." WALTERThank you. That sets it up perfectly and we're going to get into that story. But first, I think we need to take a step back and first, to talk about how did Winston Churchill get here and who he was at this point in his life. He was only 24 years old. He comes to South Africa not as a soldier, but as a reporter. MILLARDRight. So he was a young man who was burning with ambition. So although he was only 24 years old, this is his fourth war on three different continents. He's already written three books, including his first and only novel, "Savrola," and he's run for parliament for the first time and lost. And so after that, he had -- he quit the military. He had thought that that would be his road to fame and then political power. He called it the glittering gateway to distinction. MILLARDBut it was too slow for him and he was trying to find another way. But after his electoral defeat, he realized that he still needed to make a name for himself before he could win that political power he desired so much and that he thought was his destiny. So when the Boer War broke out in South Africa, he knew he had to be there. But he wasn't in the military anymore and he had been making his living as a journalist. He didn't have any money and that -- and he was an amazing writer. WALTERAnd they had a bidding war over him, didn't they? Yeah. MILLARDAbsolutely. Go big or go home, you know. That was his motto and that got him to South Africa. WALTERAnd it's interesting, you point out he didn't have a lot of money, but he came from a position of great privilege. WALTERAnd there was so much in his life that seemed to be about making sure that not only he was respected and he had this ambition, but his father, of course, well known and had his own setbacks, political setbacks. How much was this making up for the failings of his family? MILLARDIt's hugely important in Winston Churchill's life. So he's a direct descendent of the first duke of Marlborough, John Churchill. And John Churchill was given the land to build Blenheim Palace, which is this enormous, extraordinarily beautiful palace and that was built in the early 1700s. And his father, then, was the third son of the 7th duke. He was Chancellor of Exchequer. He was the leader of the House of Commons. And Churchill admired him hugely and was so proud of him, but he didn't really have a close relationship with his father. MILLARDHis father was too busy and was really very, very hard on him and that's something that Churchill regretted his whole life. And then, his father died very young, he was 45, in a very public and tragic death. And Churchill thought that he, too, would die young and he wanted to sort of make up for what had happened to his father and prove to everyone else that the Churchill name was synonymous with greatness and leadership. WALTERAnd he had something of an -- I don't know if it's fair to call it strained, but his relationship with his mother, of course, American-born, but she was a widow at -- was she in her early 40s as well? WALTERAnd she had her own romantic interests and he was not always happy about that. So talk to us about his relationship with her. MILLARDSo his mother, as you say, was American-born. She was this incredibly beautiful, socialite, born Jennie Jerome, and she was sort of the talk of England. And he adored her, but he always said sort of at a distance because she, too, was very busy. She had a very, very crowded social life and she, you know, she was a piece of work. She really was and was rumored to have had an affair with the prince of Wales, among other people. So anyway, the -- what was horrifying to her son, Winston, is that as he's about to go off to war, she tells him, look, I'm going to marry again. MILLARDYes, George Cornwallis West. He was just two weeks older than he was and was also going off to the war. And she did end up marrying George. WALTERLet's go back even further because I think a lot of folks may not know much about the Boer War. This is not something that we're schooled in. WALTERSo what is it, what was it and then we can sort of dig into what the British -- what they wanted to get from this? MILLARDSo just really quickly, the Boers were a group of South African settlers. They were largely Dutch, German and Huguenot settlers that had been there for centuries. They were very religious. They were very racist. They were very independent. When the British empire had abolished slavery in 1833, to get away from the British Empire and live as they wanted to, two years later, they went on, excuse me, what was called the Great Trek. And so they went hundreds of miles into the interior from the Cape and established their own republics. MILLARDThe problem was that they found gold and they found diamonds on this land and the man who had become the president of one of the Republics said, you know, this wealth will cause our country to be soaked in blood. And he was right. It was just a few years later. In 1880, the first Boer War broke out and then fast forward 20 years later, almost 20 years to 1899, the British still want their land. The Boers still want their independence. The British are putting troops around their republics. MILLARDThe Boers say enough is enough. Stand down or be ready for war. And the British are like, great, you just gave us our excuse to go to war. WALTERAnd as you pointed out, this is the turn of the century. The British Empire, of course, there is much hubris. There is much -- they still control -- how big was the reach of the British Empire here in 1899. MILLARDIt was enormous. It was enormous. I mean, it was larger than the Roman Empire at its height. And so that was one of the problems for the British, actually, because -- because they had all of these colonies, they were stretched very thin, constantly putting down revolts. And so they were used to colonial wars and they expected this to be just another colonial war, even though they had already fought the Boers and had lost 20 years earlier. They sort of forgot who they were fighting. So war breaks out in October and they think no big deal. It'll be over with by Christmas. WALTERAnd this sort of hubris, you can see that Churchill brought with him as well. I think the most dramatic point that you bring up about Churchill is not just his burning ambition, but this belief in his -- really, his destiny is to be here and that he feels that he is undefeatable and that nothing is going to kill him. Bullets, literally, whiz by him. WALTEREverywhere he's gone, he has escaped injury and harm. MILLARDRight. It's extraordinary. And he put himself in the most dangerous situations. So he rode a white pony on the battlefield in British India just to get attention, just to get noticed. But one of my favorite quotes from this time is he told his mother, I don't believe the gods would create so prosaic a being as myself -- so fantastic a being as myself for so prosaic an ending. WALTERI think that about myself so often. WALTERWe need to take a break here. But coming up, we'll have more of our conversation with Candice Millard. WALTERWelcome back. I'm Amy Walter with The Cook Political Report sitting in for Diane Rehm. I'm sitting here with -- in the studio here with Candice Millard. She is the author of a book, "Hero of the Empire: The Boer War, A Daring Escape, The Making of Winston Churchill." I just want to remind everyone who's listening, you can call in with a question to 1-800-433-8850. You can send us an email to drshow@wamu.org. You can find us on Facebook or you can send us a tweet. WALTER...fighting over land and property that's not their own. MILLARDAbsolutely. And that was important to me, to tell that part of the story to the extent that I could. And I go into sort of the background of native Africans and how they came to be in this part of Africa as well. And it -- and they are pulled into this war. This is absolutely not, you know, Churchill sees this land and he thinks, oh, this beautiful land of opportunity. It would be so great for the British Empire to have. The Boers shouldn't have it. And the Boers think, no, God has given us this land. When, of course, it belonged to neither of them. And there had been -- people had been living there, not for thousands of years but for millions of years. MILLARDAnd so it's fascinating. Of course they were pulled into this war. They were forced to participate in it, even to fight in it. What happens later on is the British start some of the first concentration camps. And many, many native Africans died in British concentration camps as well. What I found, what was really interesting to me, I found a man named Solomon Plaatje . He was this extraordinary person who spoke half a dozen European languages, not even mentioning all of the different African dialects that he spoke. He was largely self-educated. He served as a translator for a lot of native Africans who would be accused of crimes and taken to court and have no idea of what was going on. MILLARDHe started newspapers and he kept a diary during this time. And I found this diary. It was actually discovered like in the '70s. A man had gone into Kimberley and had asked, are there any diaries or any books or anything that were written by native Africans during this time? And somebody came out with this -- manuscripts that had been sort of tucked away. And it's extraordinary. It really is extraordinary to watch him watching these two groups of white men fighting over his people's land. And it's beautifully written. And what's interesting, Solomon Plaatje ended up becoming the first secretary of the ANC. WALTER...for what life was going to look like for South Africans. MILLARDSo the Boers are what then later become the Afrikaners. MILLARDRight. Right. And they developed the language, Afrikans. As I said, they were deeply racist. They -- part of the reason that they developed the republics is because England had abolished slavery. And Churchill was very aware of that. In fact, his father had gone to South Africa only a few years before and had written letters back to be published in newspapers excoriating the Boers for their treatment of native Africans. And he was very proud of that. And he was very much aware of the treatment native Africans fell under during the Boers. And obviously that carries through, unfortunately, for many, many years. MILLARDAnd England promised native Africans that things would get better after the war was won. And of course they didn't for a long, long time. It took us a long time to get to Nelson Mandela. WALTERLet's take us back now to Winston Churchill getting to South Africa. He's anxious to start reporting. WALTERHe wants to get on the front lines. WALTERHe ends up on a train. WALTERAnd the train is attacked. MILLARDSo it's really this extraordinary event. So, again, he's 24 years old. He's a correspondent. He's not even a member of the military. He's one of the few civilians on this train. And these armored trains are notoriously easy targets for the Boers. So the Boers are watching. And they're this very, very skilled, very invisible enemy. So they're fighting a totally different kind of war than the British are used to. So they're just watching this train go by. And, you know what? They know it's going to go this way and then it's going to come right back on this same track. So they watch it go by. They go to the bottom of the hill. They pile stones on the tracks. And they wait at the top of the hill for the train to come. MILLARDAs soon as the train comes, they start firing on it. The train does exactly what they want it to do, which is go as fast as it can to get away from them. It goes to the bottom of the hill. It hits these stones and it catapults off the tracks. So the first two cars go flying. Men are killed. Men are horribly wounded. And the engine is still on the tracks, but it's stuck behind one of the cars. It's sort of half on, half off. And Winston Churchill, who again is one of the few civilians on the train, he immediately jumps up and takes charge of the defense. And he starts running back and forth, dodging bullets, shells exploding everywhere, shouting orders. And what's more extraordinary is that everybody listens to him. MILLARDI mean these -- there are many legitimate soldiers, uniformed with their commander right there, a commander who is a friend of Churchill's and who had invited him along, who was also, it was like, yep, Winston, tell us what to do. How can we support you? And he gets it done. And he gets the train off the tracks. He goes back to help some other people. But the train gets off. Everybody who makes it out alive, every single person credits Winston Churchill's bravery and resourcefulness for saving their lives. WALTERAnd how did you find this source material? Because the book has such rich detail. Tell us a little bit about the research that you did and any trips you took to South Africa to get some of the research. Were you on those trains -- are those train tracks still there? Could you picture what it would feel like to be on that trip? MILLARDYeah. I was there. In fact, that's one of the reasons, to be honest, that I wanted to do this story, because I got to South Africa. So obviously I did a lot of research in England. I went to Cambridge where the Churchill Archives are. I went to the National Army Museum, The (word?) Archives, Blenheim Palace. And then I spent quite a bit of time in South Africa. And it's extraordinary. I went to exactly where he was captured. I went to Pretoria to the same building that was his POW camp. In fact, it's incredible. It's now a public library. MILLARD...for three days. I went into Portuguese -- well, Mozambique, which was then Portuguese East Africa, where he finally came to freedom. So it was just an incredible experience. WALTER...after this incident on the train. WALTERHe has great bravery, but ultimately he's captured and pulled into, as you point out, he's taken into a POW camp. WALTER...talk about what life was like for Winston Churchill in this camp or prison. MILLARDSo the Boers had sort of a chip on their shoulder. They thought that the British -- and it was true -- that the British thought that they were uncouth and uncivilized. And so it was important to them to show the British that they were in fact very civilized, as civilized as they were. And so they allowed these officers incredible leeway, as you say. I mean, Churchill had a guy come in and give him a haircut and a shave. They were able to order a suit, and all -- and get newspapers and sort of follow the war. So they -- it was a lot of leeway. MILLARDBut, still, to Winston Churchill, it's interesting, because he said that he hated every second of his captivity, more than he had ever hated any other period in his whole life. He couldn't bear the thought of being a captive, of being a prisoner. And it shaped him later on. He became home secretary and it was really important to him that prisoners were treated with compassion. MILLARDYou know, he said whatever they've done, how horrible, they're still humans and they deserve books and they deserve time outside and they deserve a chance to exercise. So it really shaped him and left a strong impression on him for the rest of his life. WALTER...who take on these adventures to sort of prove themselves. So can you talk to us about that -- the similarities and differences between these two figures? MILLARDI absolutely agree. In fact, the whole time I was researching it, I kept thinking how much he reminded me of Theodore Roosevelt. And you know they actually knew each other. They met at one point. And they didn't like each other. MILLARDAnd I think it's because they were so much alike. No, they were both incredibly ambitious, incredibly arrogant, incredibly well-read, amazing writers. I mean they're -- the similarity goes on and on. In fact, I always laugh about Winston Churchill -- and the same was said about Roosevelt -- you know, again and again, at this time in his life, people would say, you know, I can't stand that kid. He's going to be prime minister one day, but I cannot stand him. WALTERSo he's here at this POW camp. He's plotting every minute he can to get out. He's working with a couple of other officers who are also trying to escape. But they don't want to include him in their plans, right? MILLARDNot at all. Well, an so being Winston Churchill, his plan is not just to quietly escape. No, he's going to sort of take over the whole prison and then he's also going to take over the prison where the soldiers are staying. And then they're going to take over all of Pretoria. And then they're going to kidnap the president and they're going to end the war. MILLARDAnd so he's telling everybody in there and it's like, oh, just get away from me. And so he overhears Elmer Holden (sp?) , who is the guy who invited him to be on the armored train. And this guy Brocky (sp?) . Brocky is very strong and very savvy. And he speaks Zulu and he speaks Afrikaans. And he's been in South Africa for a long time and he knows his way around. And Churchill finds out that they have this quiet little plan and he's like, look, I want to be a part of it. And Holden feels bad because it was like, I did invite him on. And Brocky's like, no way. MILLARDHe's going to tell everybody he's not strong enough. It's going to be a disaster. But Holden says, okay, Churchill, I'll leave it up to you. We don't want you to come, but it's your decision. Churchill says, I'm coming. WALTERAnd he does come. But tell us a little bit about that. What -- it didn't exactly go along according to plan. Right? MILLARDYes. No, it didn't. So what it was, because there was this -- there was a fence that surrounded the yard of the -- of this prison. There are armed guards patrolling at all times. MILLARDYeah, you can -- yeah, right. WALTER...you could imagine what it would look like. MILLARDIt's surreal, but you could. You absolutely could. And what they discovered is that. So they had electric lights -- they knew they had electric lights that came on at night. But there was one corner that remained dark. MILLARDAnd so he said, look, if a guard is looking the wrong way, you can quickly get out. And there was a latrine that was right by that you could hide in and quickly get out. But -- so they chose their night. And they all kind of tried and it didn't work. And Churchill said, I'm just going to go over and take a look. And they're like, nothing's going to happen. Let's just go in and have dinner and then we'll try again after dinner. So Holden and Brocky go inside. But Churchill sees his chance and he gets out. MILLARDHe climbs over. But now the problem is -- so he's hiding in these bushes right outside waiting for the other guys, who know the plan, who have the food, the map, the compass, a weapon. He has nothing. He doesn't speak the language. He doesn't know his way around. And so he waits for them for almost an hour, but they can't get out. So he's trapped. WALTER...and what else? Was that it? MILLARDA biscuit, crumbling in his pocket, a few pounds, and that's it. WALTERTo go for 300 miles. MILLARDAlmost 300 miles of enemy territory. Right. WALTERI'm Amy Walter. You're listening to "The Diane Rehm Show." If you'd like to join us, you can call 1-800-433-8850. Send us an email to drshow@wamu.org. You can find us on Facebook. You can send us a tweet. An email here from Mark in Kansas. WALTERWe're going to go for -- is one of -- somebody in your life? WALTERDon't know. This could be. You are from Kansas City, right? MILLARDI am from Kansas City, right. WALTER...and that is Mahatma Gandhi. WALTER...at the same time. So how does he figure into this? He said he was -- he later became a great thorn in Churchill's side. But he ran an ambulance service, who put themselves in harm's way. Did Churchill ever mention this group or did they have any run ins early on? MILLARDRight. So Gandhi had been living in South Africa for a long time. So he was this failed lawyer. And he went to South Africa to start again. And he saw, you know, all this oppression going on that was also directed toward the Indian population. And so he started to organize. And he found that he, too, was this born leader and an incredible organizer. And -- but, you know, always, always sort of clashing with the Boers. So when the Boer War breaks out, he says he wants to help the British Empire, because he wants to prove to the British Empire that we deserve rights, the Indians do as well. And so what he did is he put together a group of stretcher bearers. MILLARDBut it's astonishing. He ends up on the same battlefield as a stretcher bearer that Churchill then later is fighting on. I mean, an he's not the only. I mean, Rudyard Kipling was also there. Sir Arthur Conan Doyle was also there. I mean it's, you know, it's history. And you always get these incredible, bizarre intersections. WALTERWell, you -- we're out of time. We're at the turn of the 20th century. We know what's -- now, in hindsight, we know what's about to come. But what is the lessons that you were able to, thanks to your research and being able to know what's to come, what did we learn from Churchill's experience, the Boer War, that would enlighten us to what we could expect from the 20th century, both in the way that the country saw itself as well as the sort of the innovations in military. Before we get -- we have to take a little bit of a break. So you can think about that. WALTERWhen we come back, we'll take your calls and questions for Candice Millard. We'll be right back. WALTERWelcome back, I'm Amy Walter with the Cook Political Report sitting in for Diane Rehm. I'm joined in the studio today, Candice Millard. She's the author of the new book "Hero of the Empire: The Boer War, a Daring Escape and the Making of Winston Churchill." When we left off, Candice, we were talking about what 1899 was like and what this experience would tell us as we moved into the 20th century, an era of course marked by a great deal of strife and war. MILLARDWell, I think what most of the -- the largest lesson that comes out of this war is the danger of arrogance. You know, it is as dangerous as it is ubiquitous. So the British come in thinking that this is going to be no problem. They nickname their commander in chief the Steamroller that will quickly take care of it, and instead they find themselves losing again and again. And what's interesting about the Boer War, it's really the beginning of modern warfare. MILLARDSo the British come in, they've only recently given up their redcoats. MILLARDAnd sort of reluctantly, grumbly taken on khakis, but they're still fighting in these precise formation, just served up for slaughter. And slowly, slowly, after losing many wars, many lives, they start to figure it out, and they start to change. And so the British Army going into the Boer War is completely different from the one coming out, and it prepares them for World War I.
WALTERThat's what I was going to say. WALTERAnd the measures that they took there, both in the weapons, as well as in the strategy. WALTERSo let's get back to Winston Churchill. He climbs over the fence. WALTERHis comrades don't join him. He's alone with basically nothing, trying to figure out how to get across the country. Is there any -- this moment in time, is this very self-confident young man having any doubts about whether he'll succeed? MILLARDIt's very, very interesting psychologically to watch the changes in him because he starts out thinking I'm absolutely going to be captured immediately, but what choice do I have. I can't go back in, I'll be shot, I've got to go forward. So I may as well just see what happens. And so -- and he finds -- as he goes farther and farther through the city, and then he's into the countryside, and he's not being caught, and he's sort of just loving his freedom, he's exhilarated, he's excited, he jumps on a train, and he hides, and he falls asleep. MILLARDAnd then he wakes up, and he realizes what has happened, I'm in huge trouble, and I've got nowhere to turn, and I'm absolutely alone. And he goes to the next -- you know, as he travels and gets deeper and deeper, knowing, you know, the Boers are humiliated and enraged, and they're searching for him, and if they find him, there's a very real risk that they will kill him. MILLARDAnd so he keeps sort of going back between incredible confidence, I'll figure out a way, I'm very resourceful, to despair. And at one point, and Churchill was not a religious man, but at one point he breaks down and prays for guidance, and, you know, it's -- it's a connection that we can feel. You know, you think -- you take this man who's so famous he's almost mythical, and you realize your shared humanity. WALTERThere is also a point at which he has to count on other people to get him through. WALTERAnd this, again, somebody who's been so self-reliant, I can do this all myself, he ends up knocking on the door, he's sort of desperate, and he ends up in a coal mining town. And can you walk us through where he was on his journey there and what that led to? MILLARDRight. So this is another aspect of Churchill's life, which is just incredible luck. I mean it's just extraordinary. So most British citizens, who are living in South Africa, had been forced out when the war started. Only a very few were kept, and it was only if they were essential to -- the Boers needed them in some way. MILLARDSo he's alone, and he sees some fires glowing in the distance, and at first he thinks it's an African village, and he thinks maybe I can find help there because they hate the Boers even more than we do. And so he gets closer, and when he gets close enough, he realizes this isn't an African village, this is a coal (unintelligible) and -- but he's so desperate at this point he just thinks I'm going to take a chance. MILLARDAnd he knocks on a door, and he -- he makes up this story. This guy answers a door, and he makes up this story, look, I'm a Boer, I fell off this train, I hurt my shoulder, can you help me, and as he's -- he's sort of amazed at himself because this is sort of coming out fully formed, this lie that he just thought up, and he realizes I don't speak Dutch, I don't speak Afrikaans, I can't pull this off. MILLARDSo this guy just listens to him, says I think you should come inside, takes him to this room and puts a gun on the table them and turns around and locks the door. And Churchill is thinking, you know, this is not looking good for me. MILLARDAnd instead the man turns around, puts out his hand, shakes Churchill's hand and said I'm English, I'm going to help you, I'll get you out of here. And he said he felt like a drowning man who had just been saved. WALTERI mean it's really -- I mean, it was literally just luck. WALTERNothing about -- nothing about that. WALTERAnd the English who were still there feeling a sense of camaraderie, they wanted to help one of their countrymen there. WALTERBut tell us, too, that there is this manhunt for Churchill, which we know who he is now, but back then he was a 24-year-old reporter, yes, with a famous last name. But the Boers were actually doing quite well in the war, they're having great success, and yet they were printing out thousands and thousands of copies, you know, wanted posters of this man. WALTERWhy did it matter to them that one guy escaped? MILLARDIt mattered a lot. They were thrilled to capture the son of a lord. Again, he sort of symbolized everything that they hate about the British empire, and now he's their prisoner. And then he escapes, and he's very cheeky. You know, he -- actually he left a letter behind that said, you know, thank you for your hospitality, I'm so sorry I couldn't be here to thank you in person, you know, you'll have to -- and they hate him. MILLARDAnd it's astonishing because all these firsthand accounts of the people who were left in the prison after Churchill escaped talked about all of a sudden everything shut down, and all those privileges they had had were taken away. Every single house is searched in Pretoria, and they said that they had -- it seemed like they had almost forgotten that they were fighting a war, so determined were they to find this young man. WALTERAnd there then was great risk in the -- for the English folks who took -- who took him in. WALTERAnd they went to extraordinary measures to hide him, including putting him in a mineshaft, which sounded miserable. MILLARDAnd it was miserable. No, it was incredibly miserable, and Churchill was just desperate. So they take him down deep into the ground where it's dark, it's dank. Strangely they had been using donkeys to help pull out the coal, and so it smells terrible, and they try to put him into an area that has a little bit of ventilation, but he's stuck down there, and he -- the first night they give him a mattress and some candles and things. MILLARDThat have been thriving down there, and every night, as soon as he puts out his candles, they're all over him, you know, running around. WALTERI want to just imagine that for a minute, everybody, lying in a bed of rats. I want to take a call from Don from Zionsville, Indiana. Don, thank you so much for calling in to "The Diane Rehm Show." DONIt's an honor, Ms. Millard, to speak with you. As a young man, my wife and I got a job before children, we call it our BC time, in London with Ball State University, the Ball family here in Indiana, in Muncie, and we were -- served the university. So we got to take day trips, and we took a tour to Bladon Church, to his burial site. DONPrime Minister Churchill's burial site. We went to of course Blenheim, to his cemetery gravesite, and I know Jenny historically, his mom as you certainly mentioned, from Philadelphia I believe, and this is of course much later in time past -- much past the Boer War, but did Winston Churchill love to travel in America? How much did he claim his Americanism? I know that he gave -- FDR gave him an American passport during World War II, and I've read his exploits with President Roosevelt in the North African campaign. DONAnd I know his Fulton, Missouri, speech, his Iron Curtain speech. So I just kind of wanted to know about how much Americanism he claimed, and I know his painting for some of his oppression. And a follow-up question, was it ever -- because I know he drank so much, his stories about drinking in Parliament during the day and whatnot, was it ever proven, like, he was an alcoholic? And I'll just take your questions off-air, thank you so much, and I'll buy your book. MILLARDThank you, thanks for calling. Those are great questions. Yes, he -- it's funny because I look at Churchill, and I think how much of him seems American to me, that -- that sort of unbridled ambition, you know, which was sort of unheard of and very uncool, especially within the aristocracy and within the military, the British military at that time. MILLARDAnd obviously, you know, there was this special relationship that came out of his connection with the United States, and think he did feel his Americanism. He was -- he adored his mother, and that was just -- it was absolutely a part of who he was. As far as his drinking, you know, I don't think that he was an alcoholic. He did absolutely enjoy -- in fact he began his sort of love affair with whiskey even before this war, and his love affair with cigars even before that. So it was a sort of a part of who he was. MILLARDBut, you know, he was such a determined guy who was always, always, always on, and I don't think he was every really blunted then by the effects of alcohol. WALTERSo here he is down in the mineshaft, he was trying to smoke some cigars, but miserable, and even his -- his friends who were hiding him out knew that he couldn't stay down there for much longer. MILLARDRight, took pity on him. WALTERYeah, so how does he go from the mineshaft to freedom? MILLARDSo they finally bring him up. They would take him up to walk for a little bit when he was hiding in the mineshaft, and finally they're, like, look, I think he's going to snap if we leave him down there. So they hid him in a room in this man, John Howard's house, and he was sort of hiding back there, and they're trying to figure out how are we going to get him out, how are we going to get him out. MILLARDAnd then they realize that this guy Burnham has a store, and he often has dealings with Portuguese East Africa, where he has to send wool into. And they decide we're going to hide him in one of these wool cars. And so they sort of carve out a little area, it was just packed with wool, and one night they slip him in, and thank God Burnham decides at the last minute, you know what, I should probably ride with him. MILLARDAnd he's absolutely essential. There's no question Churchill would have been caught at stop after stop because he has to make all these stops along the way, and again the Boers are searching for him everywhere. And -- and it's war, and so they're checking cars all the time, you can't just get through. And so Burnham is constantly bribing people along the way, look, you know what, this is really important, I've got to get there quickly, could you just pass my stuff through without inspecting it. And again and again, you know, incredible luck, by the skin of his teeth he gets out. WALTERAnd tell us, though, when he does get out, he makes it to Portuguese East Africa, but how does he actually get to freedom once he makes it there? MILLARDSo what he does is he -- as soon as the train pulls in, he's still in danger. I mean, there are Boers all over the city who could grab him. So Burnham is waiting for him, and he just kind of looks at him, and the idea is just follow me, don't say a word. And so he follows him through the streets of what is now Mobutu, and they get to where there's a British consulate. MILLARDAnd he sees it across the street, and he marches across the street, and he opens the door, and he goes up to the secretary, and he says -- and he demands to see the consul general. And the secretary looks at this filthy young man because he's covered in coal dust, no idea who he is, and says, you know, sneeringly, if you want an appointment, you can come back tomorrow. MILLARDAnd he's furious, and he stands back, and he starts shouting who he is, the window flies open, and the consul general looks down, he comes running down, and he asks him what's your name. And it's Winston Churchill. And then, I mean, he's a national hero after that. WALTERI'm Amy Walter. You're listening to the Diane Rehm Show. I want to take another caller here, Pat from Ann Arbor. Pat, thank you for calling in. PATHi, yeah, I was just, you know, Churchill is just kind of a man about town as far as world events go. You know, what experience in the Boer War, you know, 20 years later he'd be dictating the terms of the Anglo-Irish treaty, and I know the Irish took the pages from the Boers and how that impacted British tactics militarily and politically going forward. Could you just comment on that, and I'll just get off the phone and listen to your answer? MILLARDYeah, thank you. Well, it's really fascinating. So what drew me to this story is to try to figure out how you get somebody like Winston Churchill, how do you create this person who, you know, lives 90 years but among the most sort of crowded and complex years imaginable. There's so much happening in his life, and he becomes one of the most famous human beings in history. MILLARDSo how do you get there? And it's fascinating what happens to him. This is not only a launching pad for his political career, so he runs for parliament before, loses, now he's a national hero, he wins, he's off, but it -- it helps cement all these things that he sort of knew about himself. He believed he was special, he was extraordinary, he was destined, but here he proves it, you know, again and again and again he does these things that are absolutely audacious, and he does them alone, and so he has -- all these things that he uses later on throughout his life that we think of uniquely Churchill come out of this experience, you know, his ingenuity, his agility, his determination, his grit. All of these things I think help to shape the Winston Churchill we think of throughout his life. WALTERAs he gets out of South Africa, he comes back to England, and you said he's -- is he -- he's instantly a hero, and he's instantly recognized. WALTERHow long between the time he actually landed back in England did he win election? MILLARDJust a matter of months. So he came -- he actually came to the United States and went on a speaking tour, and there was actually a lot -- he didn't appreciate it because there were a lot of people who supported the Boers in the United States at that time and kind of felt some sort of -- oh, you know, they're pioneers, they're independent, they -- you know, it wasn't that long ago that we had been trying to shake off the British Empire. MILLARDAnd so anyway -- and then he goes back to England, and he very quickly runs for parliament again and wins. And he says in a letter to the prime minister, Salisbury at the time, he says there's no doubt that it -- this comes out of my popularity from the war in South Africa. WALTERAnd of course there would be so much more to come. MILLARDSo much more to the story. WALTERYeah, Candice Millard, thank you so much for joining us. Her book "Hero of the Empire: The Boer War, a Daring Escape, the Making of Winston Churchill, I'm Amy Walter with the Cook Political Report, sitting in for Diane Rehm. Thanks for listening.